Milflores means a "bunch of thousand flowers". It exactly reflects our latest Floral series collection of Incense Stick that is deeply admired for its soothing fragrance. Made using high grade aromatic & biotic materials and essential oils, our Incense Stick releases fragrant smoke which helps to meditate for long, during prayers and therapies. It is also effective to counteract bad odor. We ensure that materials are tested on quality parameters which assure no side effects while inhaling the smoke. However, purity level of the sticks is consistently checked to ensure an impeccable range. 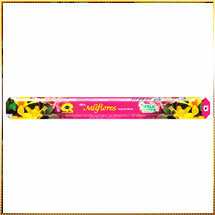 We offer precisely packed Incense Sticks assuring zero loss of fragrance during storage.